Background: Academic excellence is essential to provide opportunities for students to work together to improve their understanding of concepts in their academic core. Academic excellence helps students to teach problem-solving and collaborative learning strategies. Objective: The objective of this study was to assess Guna (personality traits) in students undergoing Yoga Instructor's Course (YIC). Materials and Methods: In all, 68 YIC students with a mean age of 28.03 ± 9.38 years participated in this single group pre-post study. The Personality Inventory data were collected before (pre) and after (post) the YIC. Statistical Analysis: Means, standard deviations, Kolmogorov- Smirnov test, and Wilcoxon signed rank test were used for analyzing the data with the help of SPSS 16. Results: The data analysis showed 11.33% decrease (P < 0.01) in Tamas Guna (dull personality trait), 0.68% decrease (P =0.819) in Rajas Guna (violent personality trait), and 10.34% increase (P <0.01) in Sattva Guna (balanced personality trait) scores. Conclusion: This study suggests that YIC can result in the improvement of Sattva Guna (balance personality trait) among students, thus paving the way for their academic excellence. However, the personality changes that characterize the efficacy of Integrated Approach of Yoga Therapy (IAYT) for students have not been reported adequately. Hence, we have designed this study to assess the efficacy of Yoga Instructor's Course (YIC) for academic performance in university students using Personality (Guna) Inventory (PI). The objective was to assess PI in university students undergoing YIC. In all, 68 YIC students (27 males and 41 females) with a mean age of 28.03 ΁ 9.38 years participated in this study. The subjects for this study were selected from Swami Vivekananda Yoga Anusandhana Samsthana (S-VYASA) University, Bangalore, undergoing a 21-day YIC program. The study was approved by the IRB of S-VYASA University. In this study, we have used PI developed by Pathak, Bhatt and Sharma. It has 24 items for Sattva Guna (balanced, gentle, and controlled personality trait), 34 items for Rajas Guna (violent and uncontrolled personality trait), and 30 items for Tamas Guna (dull and uncontrolled personality trait). It has good internal consistency and reliability and in terms of validity, all the three traits showed low correlation with each other indicating that these three traits are independent. 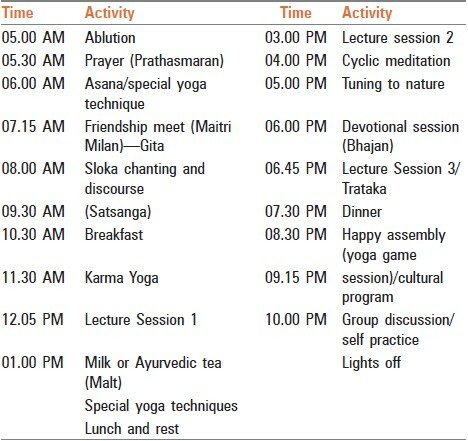 All the subjects participated in the YIC of 21 days duration [Table 1]. The program was conducted in a serene and peaceful atmosphere of the S-VYASA University in a residential setup with a schedule starting from 5 AM to 10 PM. Sattvic diet (high-fiber low-fat vegetarian and balanced diet), devotional sessions, cultural programs, and discourses from experts were the key essence of this program. The program was based on IAYT leading to the holistic development of the personality. The PI data were collected before (pre) and after (post) the 21-day YIC program. [Table 2],[Table 3], and [Table 4] show the items in their respective Guna (personality) with their interpretation and test-retest reliability co-efficient. Responses to inventory items are received in terms of choices between very much, much, moderate, little, or not at all. These raw answers are then converted to numerical values from 5 to 1, respectively. Answers to all items on all three scales are converted to 5, 4, 3, 2, or 1, as above. 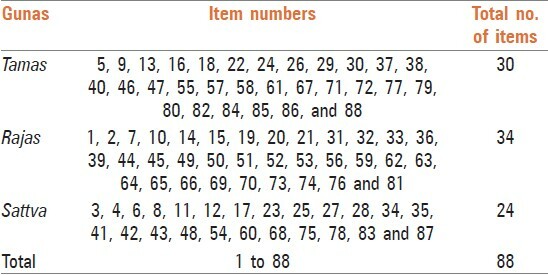 Addition of scores on all items on a particular scale gives the individual's total score on that scale. In this way, each individual receives a score on each of the three scales. Percentage of each was calculated by dividing the score of each Guna with total score and multiplying by 100. Statistical analysis was done with the help of Statistical Package for Social Sciences [SPSS]-16. The Kolmogorov-Smirnov test showed that the data were not normally distributed. We used the Wilcoxon signed rank test to compare means of the data collected before (pre) and after (post) the YIC program. The data analysis showed 11.33% significant decrease (P < 0.001) in Tamas Guna (dull personality trait), 0.68% decrease (P = 0.819) in Rajas Guna (violent personality trait), and 10.34% significant increase (P < 0.001) in Sattva Guna (balanced personality trait) scores [Table 5]. The mechanism of how yoga may reduce Rajas and Tamas and how it may increase Sattva may be understood by three cardinal principles of yoga: relax the body, slow down the breath, and calm down the mind. Recent research has shown a positive relationship between personality trait and academic performance. A previous study on yoga reported enhanced PI as a result of the practice of yoga way of life. The result indicates the importance of yoga to improve academic performance. , This study is consistent with these findings, indicating that a systematic practice of the yoga in the form of YIC can result in better academic excellence. This study suggests that YIC can result in the improvement of Sattva Guna (balance personality trait) among students, thus paving the way for their academic excellence. The authors acknowledge S-VYASA University for granting permission to carry out this work. 1. Deshpande S, Nagendra HR, Raghuram N. A randomized control trial of the effect of Yoga on Gunas (personality) and Self esteem in normal healthy volunteers. Int J Yoga 2009;2:13-21. 2. Woodroofe SJ. Shakti and Shakta. Madras: Ganesh and Company; 1972. 3. Goyanka J. Srimadbhagavadgita Tattvavivecani, Govind Bhavan Karyalaya. Gorakhpur: Gita Press; 1999. 4. Goyandka J. Srimadbhagavad gita Tattvavivecani. 15th ed. Gorakhpur, Govind Bhavan Karyalaya: Gita Press; 1999. 5. Das RC. Standardization of the Gita inventory of personality. J Indian Psychol 1991;09:47-54. 6. Pathak NS, Bhatt ID, Sharma R. Manual for Classifying Personality on Tridimensions of Gunas- An Indian Approach. Indian J Behav 1992;16:4. 8. Wolf DB. The vedic personality inventory: A study of the Gunas. J Indian Psychol 1998;16:26-43. 9. Holt WR, Caruso JL, Riley JB. Transcendental Meditation vs pseudo-meditation on visual choice reaction time. Percept Motor Skills 1978;46:726. 10. Alexander CN, Robinson P, Rainforth M. Treating and preventing alcohol, nicotine and drug abuse through transcendental meditation: A review and statistical meta-analysis. Alcohol Treat Q 1994;11:1-2, 13-87. 11. Abrams AI. Transcendental meditation and rehabilitation at Folsom prison: Response to a critique. Criminal Justice Behav 1979;6:13-21. 12. Dillbeck MC, Orme-Johnson DW. Physiological differences between transcendental meditation and rest. Am Psychol 1987;42:879-81. 13. Murthy SR. From local to global - Contributions of Indian psychiatry to international psychiatry. Indian J Psychiatry 2010;52:30-7. 14. Kember P. The Transcendental Meditation technique and postgraduate academic performance. Br J Educ Psychol 1985;55:164-6. 15. Ganpat TS, Nagendra HR. Yoga therapy for developing emotional intelligence in mid-life managers. J Mid-life Health 2011;2:28-30.